Leading out the exclusive Autodelta model range at SpaItalia will be a first official showing for its most powerful interpretation of the Alfa 147 GTA theme yet: the 422 bhp Autodelta 147 GTA AM 3.7 Super. This new version further builds on the impressive upgrades Autodelta has already made to the Alfa V6 engine: capacity increased to 3,750cc, a remapped management system, and a Ferrari-derived throttle body, coupled to the fitting of a Rotrex C38-81 supercharger delivering 0.75 bar of boost; now all taken to a new even higher level - bringing the car’s maximum power up to 422 bhp at 7,000 rpm (standard Alfa 147 GTA power is 250bhp at 6,200 rpm) and torque improved to 520 Nm. 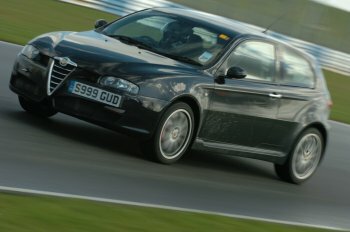 Autodelta created its first 3.7-litre supercharged Alfa 147 GTA conversion exactly two years ago, the car making its preview appearance on the inaugural ‘Autodelta European Tour’ of 2005. The arrival of this dramatic package, which initially had 400 bhp, created much attention and it was requested by a number of customers. To perfect this package fully and develop a highly dynamic chassis capable of delivering all this performance and still offer optimum day-to-day driveability, Autodelta's engineering team has embarked on an intensive development programme over the last six months that has also seen its test cars in track action conducting extensive R&D programmes of major race circuits including Donington Park, Silverstone and the Nürburgring. 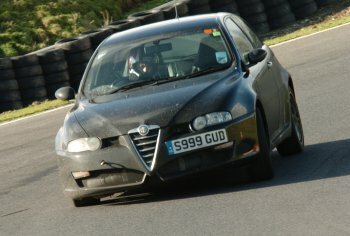 Additional work has been carried out on the Alfa V6 engine’s cylinder head, block and internals as Autodelta has perfected this package, while the upgraded suspension features new spring rates from the dedicated coilovers and revised suspension components, as well as new anti-roll bar, and wheel geometry, adjustments. Autodelta’s own in-house developed limited slip differential is an integral part. The bespoke package includes a new aerodynamic rear under wing. Autodelta are now very pleased to introduce this full option, the Autodelta 147 GTA AM (‘Autodelta Maggiore’) 3.7 Super, as an official package available for immediate ordering. 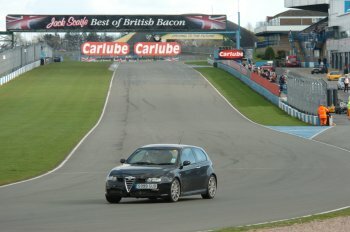 An intensive development programme over the last six months has also seen Autodelta's test cars in track action conducting extensive R&D programmes of major race circuits including Donington Park (above), Silverstone and the Nürburgring. Leading out the exclusive Autodelta model range at SpaItalia will be a first official showing for its most powerful interpretation of the Alfa 147 GTA theme yet: the 422 bhp Autodelta 147 GTA AM 3.7 Super. The car will be presented at SpaItalia this coming weekend and will be demonstrated on the famous 6.976-km Grand Prix circuit on both Saturday and Sunday by a test driver. To complement the debut of the 422 bhp 3.7 litre version at the Spa circuit, which nestles in the glorious undulating hills of the Belgian Ardennes forest, Autodelta will present the 341 bhp Autodelta 147 GTA AM 3.2 Super. Also present at SpaItalia will be the firm's most exciting new model introduction of the last year and a car that ushered in a new era at Autodelta, the 341 bhp Autodelta Brera J5 3.2 C. Previewed last summer in Monte Carlo and commercialised in February 2007 this high-performance bespoke car has created impressive worldwide demand already. 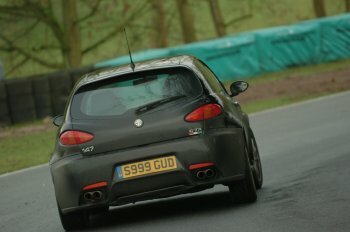 Completing the current model range will be the 400bhp Autodelta 156 GTA AM 3.7 Super. SpaItalia – now in its sixth edition – has quickly grown to become one of Europe’s leading Italian car extravaganzas. With the distinct ‘track’ element central to the two-day programme, the event showcases a glittering array of Italian machinery. It takes place on the evocative Spa-Francorchamps circuit. First opened in 1921, this is one of the world’s fastest and most demanding circuits, and a real test of driver ability. This year the ‘Featured Marque’ at SpaItalia is Maserati poignant as the Trident brand is celebrating the occasion of the fiftieth anniversary of Juan-Manuel Fangio’s F1 World Championship title claimed at the wheel of the legendary 250F. A highlight of the event will be the presence of Maria Teresa de Filippis the first woman to drive in an F1 Grand Prix and a lady who is synonymous with Maserati. The 2007 SpaItalia event is scheduled for Saturday and Sunday, June 2 & 3.